I understand the below concept about electric fields, but I'm curious what terms are used to actually describe the two kinds of electric fields covered in this tutorial. The direction of electric fields is always defined as the direction a positive test charge would move if it was dropped in the field. If you dropped a positive test charge near a negative charge, the test charge would be attracted towards the negative charge. So, for a single, negative charge we draw our electric field arrows pointing inward at all directions. What is the term you would use to describe the electric field defined in the bold statement above? That same test charge dropped near another positive charge would result in an outward repulsion, which means we draw arrows going out of the positive charge. Likewise, what is the term used to describe the other kind of electric field? I'm at total noob at all this stuff, but I am a little confused about the flow of electricity. In the section A Short Circuit that has a diagram of a battery it shows the flow of electrons going from the negative end of the battery to the positive end, but in the tutorial for a circuit (https://learn.sparkfun.com/tutorials/what-is-a-circuit) it shows the flow of electricity going from the positive end to the negative end. A second question related to this is if you need to use a resistor, does it matter if it is placed before or after the LED or does a resistor just need to be placed somewhere on the circuit. Thanks! What youâve stumbled across is current vs electron flow. Current is the sum of all effects of electron, ion, proton, and hole flows. Electron flow is just electrons. Try not to focus only on electrons in metal wire, you'll miss out on what's going on inside the battery and LED semiconductor. 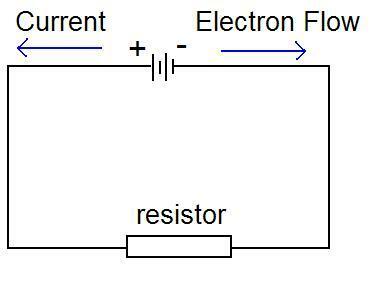 If all you have is a battery, LED and resistor in series, whether the resistor is before or after the LED does not change the current or electron flow. Yep, those electrons are funny. Many, many moons ago someone discovered electricity, they didn't know about electrons, they just noticed things work. But they did know that directionality mattered, but what direction? Well they didn't know, and didn't have the ability to find out, so they guessed. Yep, they needed a standard so they could effectively talk about and use electricity and so they made one. Well, they guessed wrong (they had a 50/50 chance). Eventually we figured out about electrons and which way they were going, but by time we figured that out we couldn't really go back and change the standard. So yes, electricity flows the opposite way the electrons do, because of the way we defined current many many years ago. While we do show how electrons actually flow in this tutorial, in the real world we generally just talk about electricity. As for the resistor, it doesn't matter. A popular analogy for electricity is water flow. Think of a water pipe with a 1ft diameter as a wire, you have a source of water, that can pass up to 100 gallons/second through the pipe. That pipe is passing as much water as it can. You can put a pipe with a 1in diameter somewhere between your source and the end, and all of a sudden that 1ft pipe isn't passing as much water. A resistor works similar to that smaller pipe. If you put it somewhere between your source and your end (power and ground) it will limit how much current there is all along that wire. Hope this makes some sense and good luck on your journey into electronics. Wow! this tutorial is amazing.It was really helpful. Thanks a lot. What a great overview of electricity!